The JANNAF discounted room block at the Crowne Plaza Dayton is now OPEN for reservations. Questions about hotel reservations? Contact JHU WSE Energetics Research Group at 410.992.7302. The June 2019 meeting will be held at the Dayton Convention Center in downtown Dayton, Ohio. 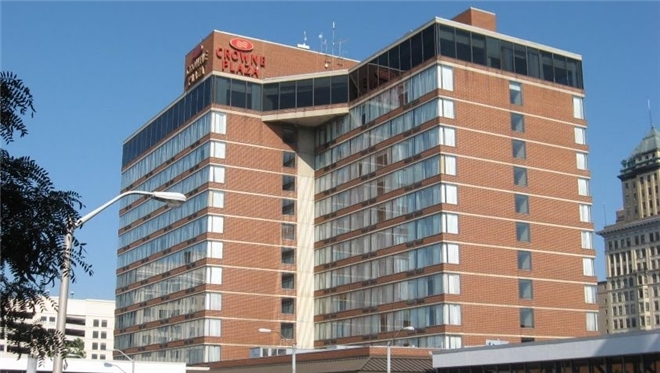 Discounted hotel rooms have been arranged for JANNAF attendees at the Crowne Plaza Dayton, located across the street from and connected via sky bridge to the Convention Center. For more about the hotel, see below. The history of Dayton is one of groundbreaking invention and unsurpassed hospitality. You'll find multiple aviation-related attractions, fine dining, local breweries, and more during your time in Dayton. The Oregon Historic District's many restaurants is just a short walk from the convention center and hotel. And Wright-Patterson Air Force Base, where classified sessions will be held, is just a short 15 minute ride from as well. The Crowne Plaza Dayton offers complimentary airport shuttle service to/from the Dayton International Airport. If flying into Cincinnati or Columbus, we recommend renting a car to get to Dayton. More information about ground transportation options can be found on each airport's websites. If attending classified sessions at Wright-Patterson Air Force Base, attendees will need to drive; carpooling with other attendees is encouraged. If driving to to Dayton, downtown is located only about 8 miles from the I-70 and I-75 interchange, making the city very easy to get to by car. Overnight self-parking is free at the Oregon District Parking Garage (attached to the hotel by skywalk) for guests of the Crowne Plaza Hotel. Click here for additional parking information / instructions for hotel guests. For attendees who are local or are staying elsewhere, parking is a maximum of $6 per day at the Oregon District Parking Garage. The JANNAF room block at the Crowne Plaza Dayton is now open for reservations. The JANNAF discounted room rate per night for all attendees is $103 plus applicable state and local taxes (currently 13.5%), for single or double occupancy. This rate is equivalent to the GSA FY 2019 per diem rate. Additional details are below. Click the "JANNAF Discounted Reservations" button below to reserve your room. The Crowne Plaza Dayton is conveniently located in downtown Dayton, across the street from the Dayton Convention Center, and just a couple of blocks from the Oregon Historic District (see below for more information). The hotel's address is 33 East 5th Street, Dayton, OH 45402. A limited number of sleeping rooms have been reserved at the Crowne Plaza Dayton at the discounted JANNAF rate. Your patronage of the official meeting hotel makes it possible for JANNAF to secure the space at the Convention Center necessary for this event at a greatly reduced cost. The hotel not only offers a discounted rate for JANNAF attendees, but staying in the group block helps JANNAF meet its obligation to the hotel and Convention Center, avoid penalties, and keep meeting registration prices down. We thank you in advance for your support. Each individual is responsible for his/her own reservation. These discounted rooms will be held for JANNAF attendees until the cut-off date of Monday, 13 May 2019, at 11:59 p.m. Eastern Time, or until they sell out, whichever comes first. Reservations at the JANNAF rate of $103 per night may be made either online (recommended) or by phone. When making your reservation online, please be sure to reserve your room via the JANNAF reservation link provided to the left under "Reservations" or click on the button below, to ensure that you receive the JANNAF discounted rate at the Crowne Plaza Dayton, and so that your reservation is counted toward the JANNAF room block commitment. If someone else will be making your reservation on your behalf, please share the link with them. If you are an IHG Rewards Club member, you can still earn rewards for your stay when reserving your room in the JANNAF block! Please note that you will only be able to reserve a room with the online reservation link for nights included in the official JANNAF discounted room block. Rooms are available any time between the nights of 2 June and 6 June (checking out 7 June), until they are sold out. For additional reservation assistance at the Crowne Plaza Dayton, please call 1-800-689-5598. Be sure to request the JANNAF discounted rate if making your reservation by phone. Dayton is located in Western Ohio. 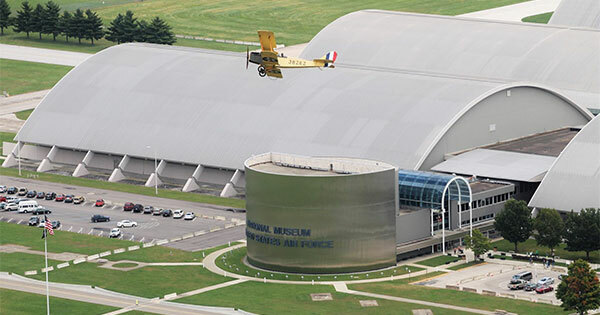 In addition to being the site of of the Wright-Patterson Air Force Base, the area is rich with aviation history. Walk in the steps of the Wright Brothers at Carillon Historical Park, the National Museum of the United States Air Force (the world’s largest and oldest military aviation museum and the state’s most visited free tourist attraction), or the Dayton Aviation Heritage National Historical Park. These are just three of the 16 sites included in the National Aviation Heritage Area in and around Dayton. Other nearby points of interest include the SunWatch Indian Village/Archaeological Park, and America's Packard Museum. Dayton's oldest neighborhood, the Oregon Historic District, lies just a couple of blocks east of the convention center and hotel. Restored historic buildings have been repurposed as an eclectic mix of coffee shops, restaurants, shops, art galleries, nightlife, and historic landmarks; this neighborhood is a must-see for visitors. The city's outdoor performance space, Levitt Pavilion, is adjacent to the hotel, with free concerts scheduled Thursday through Sunday from May to September.